Please use this page as a resource to help guide you through mdm.com. If you don't see your question listed below or you can't seem to find the answer you're looking for, contact info@mdm.com or call 888-742-5060 and we will be happy to assist you. I am logged in but still don’t have access. What do I do? I’d like to change the name, email, password and/or address on my account. How do I do that? It’s asking me to login to view an article, but I thought I was logged in? I went to retrieve my password, but the one I was emailed doesn’t work. I went to the “retrieve password page” but never got a new password in my email. When is the issue of MDM Premium/Modern Distribution Management available? Are we notified when a new issue is released? I have a digital subscription. How do I get the current issue? Is it emailed to me? How can I download the current issue to my iPad/tablet/etc.? How do I access special reports? How do I print out an issue/article? I want to change my term or access when I renew. Can I do that? How? I would like to cancel my subscription. How do I do that? Who do I contact if I have problems with your website, a product purchased on mdm.com or have trouble logging in­? Are my colleagues eligible for a discount because I’m a subscriber? Are group subscriptions available? If I subscribe to digital only can I still print the issue? Where is my receipt? Where can I request a copy? I need an invoice. How do I get one? I ordered a PDF report. Do I download it or is it sent to me? I ordered an MDM Webcast DVD. Can I get downloadable digital files for that too or in place of the DVD? What are your terms and conditions for your research reports? I ordered an e-book. How do I access it on my e-reader? How long has MDM Analytics been serving industrial markets? For which product categories do you offer data? In what format will I receive reports? How much do your reports cost? What are NAICS and SIC codes, and what’s the difference? Why does MDM Analytics use SIC codes, not NAICS? How does MDM Analytics estimate market sizes? Do you have resources that can help me better understand the use of market data in creating my sales strategy? What is MDM Premium? What is the difference between that and this website? I receive your emails every day, but I can’t remember my login information. Can you please send/reset? Why are some articles free and others not? Why can’t I access this article I want to read? Why can’t I access the article I want to read? What is MDM Premium and what is the difference between that and MDM Update? What is the cost of MDM Premium? What info do you have about pharmaceutical distribution? Where can I find a list of the largest distribution companies? Where can I find a list of building material suppliers? Do you have longer lists of distributors other than your Market Leaders list? Do you take article/blog submissions? Can I post a job to your site? Where/how can I post a job? What are the differences between your reports? I get too many emails from MDM. I still want to get some but not every day. Is there a way to manage my email preferences? How do I sponsor a webcast or advertise on your website? I know I’ve signed up to receive emails from mdm.com but I haven’t been getting them? Subscribe online here: www.mdm.com/subscriptions for instant access. If you’d prefer to subscribe by other means, please email info@mdm.com or call 888-742-5060. Click on login and enter in your login credentials (email/password). You should see your name and expiration date at the top of our page when you are logged in. If you see your name but no expiration date, your subscription may have expired. Visit “My Account” or call 888-742-5060 for assistance. Refresh your browser while on our site. If you are using Internet Explorer as your Web browser, hit Ctrl+F5. If you are using any other Web browser, hit Ctrl+Shift+R. If this process does not work, please contact info@mdm.com or call 888-742-5060. You can also email info@mdm.com or call 888-742-5060 for help. When I try to read an article it asks me to login to view, but I thought I was logged in? First, check that you do not have caps lock on. Our passwords are case sensitive. Also passwords cannot be copied and pasted. They must be typed. If neither of these were the issue, please contact info@mdm.com or call 888-742-5060. We will assist you as soon as we can. Please check your junk/spam mail folder. If you cannot find it there, please contact info@mdm.com or call 888-742-5060. 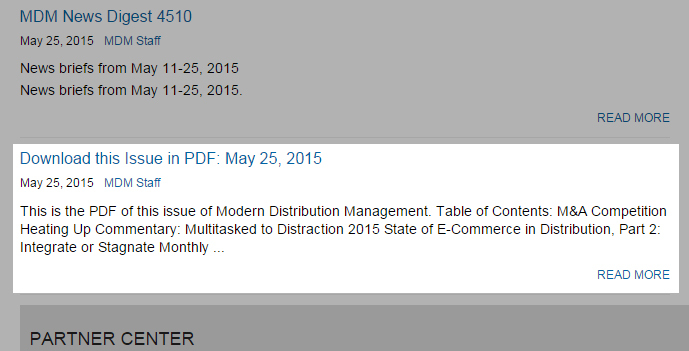 We publish our newsletter Modern Distribution Management on the 10th and 25th of each month, except in June. We publish a special double issue on June 25 which is comprised of both our June 10 and 25 content. MDM Premium Subscribers have digital access to the new issue the day it is released. If you have a print subscription arrival date varies due to shipping, however it should arrive around the publish date. You must be logged into mdm.com to see this link. If you are not receiving this email, contact info@mdm.com. If you click on “Previous Issues,” you’ll be taken to the last issue’s table of contents. If you look to the right, you’ll see a drop down labeled “View Premium Issues” which will give you a list of over 10 years of archives. If you click on the cover image of the issue, you’ll be taken directly to a link to download the issue in PDF format. NOTE: If the download link does not appear, please check to make sure you’re logged in. If you are logged in and the link is not visible, please contact us at 888-742-5060 or at info@mdm.com. To save the current issue to your iPad for viewing offline, first make sure you have iBooks installed. Click on the "Download PDF" link below. Once the pdf appears in your browser, tap the screen near the top of the pdf image and select "Open in 'iBooks.'" This will save a PDF of the issue in your iBooks library. If you are an MDM Premium subscriber, you can access our special reports here. If you are not an MDM Premium subscriber, you can purchase our Special Reports in the MDM Store. From here you can print, email to a friend, share on social networks, request reprints or adjust font size. You can renew at any time. Unless otherwise specified, you’ll receive renewal notices 3 months prior to the end of your subscription. You will be notified both by mail and email when it is time to renew. You can either fill out the form and return to us by mail or you can renew online by visiting “My Account” at the top of our site. You can also renew by calling 888-742-5060. Whether you renew by mail or via our website, you will be given the chance to change your term. Just choose the new term you’d like to subscribe for at the time of your renewal. If you are on our automatic renewal option and would like to change your term or update your credit card on file, please contact info@mdm.com and we will be happy to talk about your options and make any changes to your term of service. If you wish to cancel your subscription, please email info@mdm.com or call 888-742-5060 for a cancellation request. You can also reply to your renewal email and ask to cancel or return a printed renewal form to us for a cancellation request. No. Our subscriptions are for your individual use only. If you’d like a colleague to have access to MDM Premium, we do offer discounted and group rates. If you are using MDM as a resource for educational purposes, please contact info@mdm.com for more information. Who do I contact if I have problems with you website, a product purchased on mdm.com or have trouble logging in­? Please call 888-742-5060 or email info@mdm.com. Please note that office hours are from 8 a.m.-5 p.m mountain time Monday through Friday. We do offer discounted group rates for larger groups and colleague discounts. If you have a subscription, please refer your colleague to us and we can set them up. To learn more, please visit our group subscription pricing page. You must have at least one subscriber at full price. Yes, you can print out individual articles or download the PDF of the issues and print that out. Once you’ve processed payment on our website, you should automatically be directed to a receipt page. If this does not show up, please contact us at info@mdm.com or call 888-742-5060. You’ll also be sent a receipt via email. After your purchase, you should have received an email receipt in your inbox. If you don’t see it there, check your spam folder. If you can’t find it, please email info@mdm.com and we’ll gladly send you a copy via email. If you are a frequent purchaser, please have your IT department add info@mdm.com to your whitelist. For more information on whitelisting, click here. If you require an invoice for your records we are happy to provide one. Please email info@mdm.com or call 888-742-5060. After you place your order, you should be taken to a receipt page that displays a download link. Click that and your download should start immediately. If you don’t see that or if you navigate away from the receipt page, you will also see a download link next to your product description at the top of the receipt that was emailed to you. Yes. Email info@mdm.com and we’ll send you the same files that are found on the disc in .zip format via Dropbox. Please allow up to three business days to process your request. Immediately after ordering an e-book, you should have seen a link on the confirmation page to download the book. Please make sure you have iBooks or another ebook reader installed on your device before downloading this item. Click on the e-book link to download to your e-reader. If you have difficulties, please call us at 888-742-5060 or email us at info@mdm.com. Thank you! MDM Analytics is the market intelligence division of Modern Distribution Management. We provide better visibility into industrial product markets by helping customers quantify demand by geography, customer type and product group. Our data helps identify current market and account penetration for additional sales opportunities. MDM Analytics supports a wide range of industrial market information needs with standardized market reports, custom research projects and software tools. For ongoing research needs, we offer a subscription service with unlimited access to the MDM Analytics database for the U.S. and Canadian markets on more than 200 MRO/OEM industrial product classes. This allows your staff analysts 24/7 access to the MDM Analytics database at the ZIP/postal code level and the ability to create custom classes for analysis. It offers an ongoing tool to segment effectively by customer SIC and optimize sales and marketing efforts. Learn more about MDM Analytics' products and services. Rusty Duncan founded Industrial Market Information in 1986. MDM acquired the company in 2011 and changed the name to MDM Analytics in 2015. Duncan – whose grandfather started and grew an industrial distribution company in Minneapolis, MN – continues to serve as a consultant and advisor. The roots of the company go back to 1967, when the economic models were developed and refined from other economic sectors. MDM Analytics offers data for more than 200 industrial MRO/OEM product groups. View the full list here. Data sets and reports are delivered in Excel spreadsheet format. Click here to download sample reports. Most data sets and reports are delivered within a few hours of request. Complex projects usually take no more than 24-48 hours. MDM Analytics provides more standard research reports and data sets at a lower cost than any other source today. Visit our report pricing page for details. The North American Industry Classification System (NAICS) is the standard used by federal statistical agencies to classify business establishments for the purpose of collecting, analyzing and publishing statistical data related to the U.S. business economy. NAICS was developed under the auspices of the Office of Management and Budget and adopted in 1997 to replace the Standard Industrial Classification (SIC) system. We update our proprietary ratio models using the most recent government data, for which the standard is NAICS codes. However, most of our customers have retained SIC codes as the basis for their marketing analysis, so we deliver MDM Analytics data sets with 4-digit SIC format as the standard. We strive to meet the current needs of our customers and continually evaluate how the information is delivered to ensure that we do so. MDM Analytics employs a proprietary statistical model using consumption ratios applied against both government and private databases. Over 25 years, we have analyzed end-user consumption patterns across all NAICS (formerly SIC) sectors for more than 200 MRO and OEM industrial products. Our resources page includes free white papers and videos about using MDM Analytics data to develop market strategy and improve sales planning. You may also visit our Distributor Analytics blog for regular updates and tips on using analytics in your sales strategy. MDM Premium is a subscription that includes our newsletter Modern Distribution Management, as well as exclusive access to our archives of more than 10 years of content. MDM Premium subscribers also receive exclusive discounts on select store items including our data reports. Mdm.com is our website on which you can follow the day’s news, read our blogs or shop in our MDM store. You can also subscribe to our free, daily e-newsletter, MDM Update, or just get the week’s news in digest with MDM Week in Review. Login is required for access to all MDM Premium articles and downloadable PDF reports. 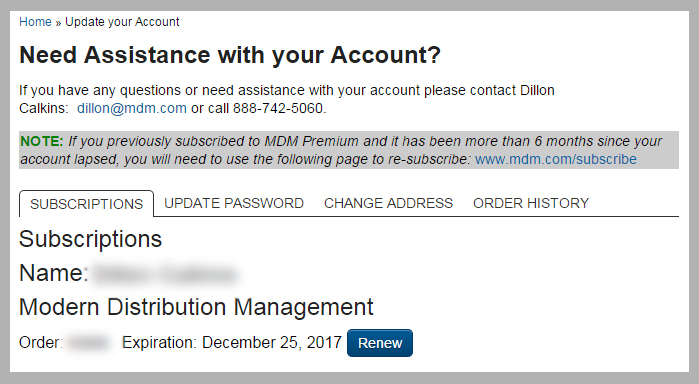 If you are a paid subscriber, please email info@mdm.com, we’d be happy to check on the status of your MDM Premium subscription and reset your password. You do not need a login to access our blogs or daily news items, to view webcasts or shop in our MDM store. Many of the articles on our site are behind a paywall because they are part of an MDM Premium subscription. You must have a paid subscription to access these articles. However, if you would like these articles and special reports, they are available for individual purchase. Look for this call out at the bottom of our article pages. Most of our articles are behind a pay wall and available only to paid subscribers. If you are a subscriber and believe your subscription is still active, please contact info@mdm.com or call 888-742-5060 for support. MDM Premium is our twice-monthly newsletter subscription, Modern Distribution Management, plus other benefits. MDM Update is our free daily e-newsletter that compiles that day’s top news, blogs and relevant articles. Yes. Please click here to learn more about or request reprints. You can also email editor@mdm.com to request reprints or inquire about any questions you may have. Please visit our subscribe page, www.mdm.com/subscribe to learn more. Contact info@mdm.com or call 888-0742-5060 for student and group rates. What information do you have about pharmaceutical distribution? Information on the pharmaceutical distribution industry is curated by Dr. Adam J. Fein and provided to us through a partnership. For more detailed information on this sector, please visit: www.drugchannels.com. Our annual Market Leaders list is your best source for information on the top in the industry. Please visit www.mdm.com/marketleaders to learn more. For more information on the top distributors, please contact our editorial team at editor@mdm.com. Because of how we compile our Market Leaders lists, we do not have longer lists. To view our methodology, click here. We do not accept unsolicited articles. We welcome story idea submissions on topics relevant to wholesale distribution and are always looking to expand our source database. If there is an idea that you think might be of interest to us or if you believe you should be included in the source database, please email editor@mdm.com. You can post jobs openings at your company on our site for free. Click here to go to the jobs board and click on the “Submit a Job Board Ad” to post. Please contact info@mdm.com or 888-742-5060 if you have any questions. Please email info@mdm.com or call 888-742-5060 to discuss our reports or if you have detailed questions about the data we provide reach out to our data branch MDM Analytics at analytics@mdm.com. You can manage your email preferences here. Please visit our advertising page here, or contact Craig Riley at craig@mdm.com or Diane Houghton at diane@mdm.com. First check your spam/junk folder. Also, please contact your IT person or department and ask them to whitelist info@mdm.com. Click here for more information on whitelisting.